Obituary – Coleman, Lola Inez (Adams) « Perry High School Alumni Association, Inc.
– daughter of Mr. and Mrs. M. V. Adams, was born March 9, 1919, in Seveir County, Arkansas. She has attended the Justice School, Wewoka, Oklahoma; Taft Union High School, Taft, California; Gladewater, Texas; Hobbs High School, Hobbs, New Mexico,; Carlsbad High School, Carlsbad, New Mexico; Perry High School, Perry, Oklahoma. She was awarded a sweater in basketball. She expect to go to college in Ada next year or take a beauty course, her special interest being beauty work. Lola Inez Adams Coleman, 94, passed away Wednesday, Nov. 6, 2013 under the tender care of Twilight Nursing Home staff and Mercy Hospice. Mrs. Coleman was born March 9, 1919, in Gillham, Ark. She was preceded in death by her husband of 50 years, Joe; her parents, Morley and Hattie Adams; son-in-law, David Garland; granddaughter Kristine Girouex; great-granddaughters Molly and Jordan Wilson and Tori Peavler; and her younger brother and sister, Virginia Knowles and Morley Adams, Jr.
Mrs. Coleman is survived by her daughters and sons-in law, Nancy and Jeff Barton of Ardmore, Okla., and Jody and Glenn Blanchard of Corsicana, and Tom Peavler of Waverly, Kan. She also leaves grandchildren Tom Peavler and Dana Peters of Independence, Mo. ; Tricia Peavler of Alexandria, Va., Tim and Susan Peavler of Spring Hill, Kan.; Joel Garland of Fort Worth, and JoLynn and Paul Wilson of Corsicana; great-grandchildren April Peavler of Carlisle, Pa., Shawn Peavler of Independence, Mo., Annie Peavler of Overland Park, Kan., Trey Peavler of Spring Hill, Kan., Haley Garland and Riley Wilson, both of Corsicana, Marcellus, Egypt, and Olivia Peavler of Carlisle, Pa., and dear friends, Al Smith and Barbara Duran of Denver, Colo.
Mrs. Coleman grew up in the oil fields of Oklahoma, Texas, and California. She and her husband raised their children in his home town of Pawhuska, Okla., before moving to Denver, Colo. Mrs. Coleman never stopped learning. She continued to take college courses that enabled her to rise to the rank of GS-12 in Civil Service, a rank unheard of for women of her era, at the Air Force Finance and Accounting Center in Denver, Colo. She adored the Denver Broncos and held season tickets for 30 years, even traveling to their spring training sites and many out of town games. She was an avid card player, and rarely lost a game. She was an exquisite seamstress, cook, and hostess. She loved entertaining and her home was always filled with great food and great times. After her husband passed away, and until her very late 80s, she drove a 38-foot motor home all over the United States and Mexico by herself. Mrs. Coleman was a world traveler and enjoyed a long retirement in either her beloved Rocky Mountains or on the beaches of Puerto Penasco, Mexico and San Benita, Texas. Hawaii was a favorite destination and she made several trips there as well as to Europe, the Caribbean, and the British Isles. 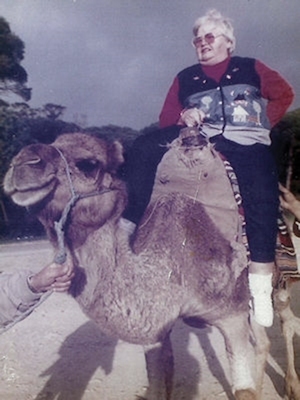 She loved adventure and went to Morocco with her daughter, Nancy, at age 77 and rode a camel. She told the family, “It took two men and a boy to get me on that camel, but I had to do it because I wasn’t sure I’d ever get another chance.” That statement epitomized her unparalleled zest for life and adventure. Mrs. Coleman will be cremated under the direction of Griffin-Roughton Funeral Home in Corsicana and The Neptune Society, according to her wishes. She will be buried with her husband at Ft. Gibson National Cemetery in Oklahoma where her mother and father are also interred. The family will gather for a private memorial and a true celebration of her remarkable life. The family wishes to express their incredible gratitude to Jordan Golden and Alicia Rogers and the amazing staff at Twilight Nursing Home in Corsicana for their kindness, care, and concern for Mrs. Coleman. This journey would have been much more difficult for the family without their unwavering compassion and support. They also wish to thank Mercy Hospice and especially Nona Shirley, for their wonderful care in their mother’s final days. In lieu of flowers, please support the Care Center at Northside Baptist Church, 2800 N. Beaton in Corsicana, TX, 75110 or Mercy Hospice at 417 Oak Bend Suite #170, Lewisville, TX 75067.